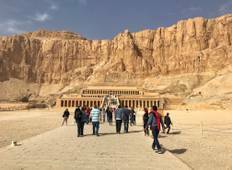 "Egypt was incredible! The country was very safe and welcoming. Everything ran very..."
"Great tour, one of the best I’ve done. Pete is a great guy with a lot of knowledge"
"Mohammad was good for our beginning day and end day. Ayman was fantastic. He was..."
"Adham our guide was an absolute legend, we fell in love with him. The accommodation..."
"Amazing and so stress free, this trip was one of the best trip so far! From the beginning..."
"Guide was very knowledgeable and informative at all the places we visited. He was..."
"Peter was a FABULOUS guide we enjoyed him so much, all the activities were interesting..."
"Excellent guide. Made the trip awesome. Food included had a lot of bread. Would recommend..."
"Great locations, and tour guide was helpful and very informative."